From the bloodied battlefields of the American Revolutionary War to a home in modern-day Paris, we learn about Marcus and Phoebe’s journeys to becoming a vampire in Deborah Harkness’ TIME’S CONVERT. We first met Marcus as Marcus Whittmore in the All-Souls Trilogy, a scientist and physician working in Matthew’s lab. But the spirited, blue-eyed vampire was once Marcus MacNeil—a young man who escaped his puritanical beginnings and learned to become a skilled field medic and surgeon’s assistant. While Marcus reminisces about his troubled past, Phoebe Taylor, the Sotheby’s employee who fell for Marcus, learns the intrinsic struggles of vampire infancy. She is kept in isolation during her first three months, as she learns to adapt to the many challenges of transitioning from a warmblood to an immortal. We also visit with Matthew, Diana and their half-witch, half-vampire twin toddlers Philip and Becca. The twins are already demonstrating a formidable flair for magic, which unnerves their parents. We follow these three narrative strands over the course of a summer. The more substantial story line centers on Marcus, as we learn about his abusive birth father, his experiences during the Revolutionary War, and what led him to become a vampire. We also delve deeper into his relationship with Matthew. They grew up and lived in such disparate times that naturally, that created a rift in how they understood each other. The All Souls Trilogy is arguably my all-time favorite series with its unique mix of history, magic, science and romance, all which came alive beautifully through Deborah Harkness’ skilled hand. 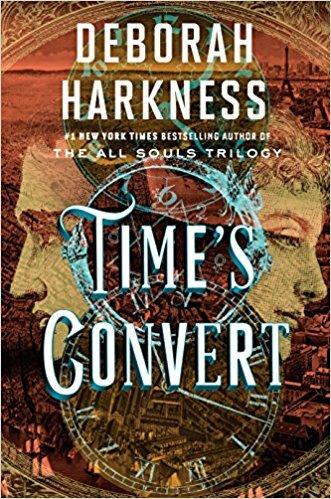 And although I very much enjoyed TIME’S CONVERT because I love these characters and this world, it didn’t have the propulsive, addictive nature of its predecessors. There wasn’t really a secret to uncover, or a mystery to solve or even a romance to see take shape. It really felt like a visit with characters we’ve come to know, where we used our time with them to get to know them better. Fans of the series will no less delight in this much-anticipated visit.